1. Introduction. An introduction to colloidal systems. Mathematical preliminaries. Statistical mechanics. Appendix. Exercises. Further reading and references. 2. Brownian Motion of Non-Interacting Particles. Introduction. The Langevin equation. Time scales. Chandrasekhar's theorem. The pdf on the diffusive time scale. The Langevin equation on the diffusive time scale. Diffusion in simple shear flow. Rotational Brownian motion. Exercises. Further reading and references. 3. Light Scattering. Introduction. A heuristic derivation. The Maxwell equation derivation. Relation to density fluctuations. Static light scattering (SLS). Dynamic light scattering (DLS). Some experimental considerations. Light scattering by dilute suspensions of spherical particles. Effects of polydispersity. Scattering by rigid rods. Exercises. Further reading and references. 4. Fundamental Equations of Motion. Introduction. A primer on hydrodynamic interaction. The Fokker-Planck equation. The Smoluchowski equation. Diffusion of non-interacting particles. The Smoluchowski equation with simple shear flow. The Smoluchowski equation with sedimentation. The Smoluchowski equation for rigid rods. Exercises. Further reading and references. 5. Hydrodynamics. Introduction. The continuity equation. The Navier-Stokes equation. The hydrodynamic time scale. The creeping flow equations. The Oseen matrix. Flow past a sphere. Leading order hydrodynamic interaction. Faxén's theorems. One step further: The Rodne-Prager matrix. Rotational relaxation of spheres. The method of reflections. Hydrodynamic interaction in shear flow. Hydrodynamic interaction in sedimenting suspensions. Friction of long and thin rods. Appendices. Exercises. Further reading and references. 6. Diffusion. Introduction. Collective diffusion. Self diffusion. Diffusion in stationary shear flow. Short-time diffusion. Gradient diffusion. Long-time self diffusion. Diffusion in stationary shear flow. Memory equations. Diffusion of rigid rods. Appendices. Exercises. Further reading and references. 7. Sedimentation. Introduction. Sedimentation velocity of interacting spheres. Non-uniform backflow. The sedimentation-diffusion equilibrium. The dynamics of sediment formation. Exercises. Further reading and references. 8. Critical Phenomena. Introduction. Long ranged interactions. The Ornstein-Zernike static structure factor. The temperature and shear rate dependence of the turbidity. Collective diffusion. Anomalous behaviour of the shear viscosity. Appendices. Exercises. Further reading and references. 9. Phase Separation Kinetics. Introduction. Initial spinodal decomposition kinetics. Initial spinodal decomposition of sheared suspensions. Small angle light scattering by demixing suspensions. Demixing kinetics in the intermediate stage. Experiments on spinodal decomposition. Appendices. Exercises. Further reading and references. Index. 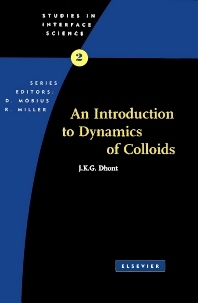 One of the few textbooks in the field, this volume deals with several aspects of the dynamics of colloids. A self-contained treatise, it fills the gap between research literature and existing books for graduate students and researchers. For readers with a background in chemistry, the first chapter contains a section on frequently used mathematical techniques, as well as statistical mechanics. • experimental light scattering results. For universities and research departments in industry this textbook makes vital reading.